NEW! Is this a beard balm? Heck no, that stuff will rough up your bead. This is a beard saver. 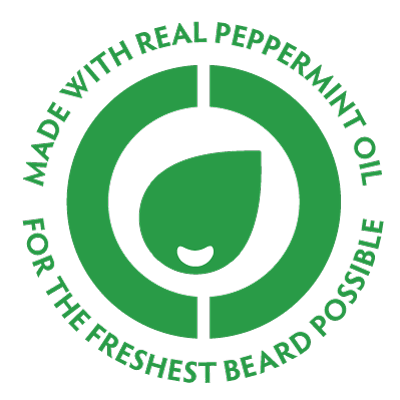 Real peppermint beard oil adds shine to your beard and "wakes up" tired skin. Like our award-winning Beard Saver™, a better than beard oil alternative, the Fresh Mint Beard Saver™ is a daily leave-in conditioner for your beard. Bluebeards beard saver relieves beard itch, adds shine and softness, and promotes healthy beard growth. For the established beard, just a dab rubbed throughout the facial hair, from root to tip, will manage the most unruly facial hair. Great for both your scruff and your skin. Made in the USA. this product makes my beard easy to manage and has a fresh scent !! Tried the mint beard saver to see if it could be any better than the original, which I think is fabulous. The mint is phenomenal!! Very refreshing and I am surprised at the comments complimenting the scent. I think it is time to try all of the mint product line... Keep up the good work!! I have been a fan of the beard saver original and thought I would take advantage of a recent discount offer to try the mint version. Amazing product! There is a freshness and perceptible coolness that really envigorates. I really appreciate the fact the product is not greasy. This beard treatment works great. It is not an oil or a balm but is the best of both in one product. It hydrates like an oil and helps control like a balm. There is nothing else out there like it. No more trying different oils and balms for me. This will be my everyday staple. My beard has never looked better or well maintained. Looks, smells, and feels good. Very happy I found this product. Proof that Beard Saver works is that my wife praised it! It has that hint of tingling when you first put it on. It's not overpowering. It just feels refreshing. Even the peppermint doesn't linger, so it's not going to compete with cologne or whatever.It's just a nice, fresh twist to the original, but supposedly peppermint oil promotes growth, so we'll see. I really like beard saver, but maybe just me, the mint beard saver is to much for me. The mint is overwhelming. Just not to my liking.